This page is about the aircraft F4F-4. For other uses, see F4F (Family). The F4F-4 Wildcat is a Rank II American fighter with a battle rating of 3.0 (AB/SB) and 2.7 (RB). It was in the game since the start of the Open Beta Test prior to Update 1.27. The Wildcat is a sort of middle child between the F2A Buffalo and the F6F Hellcat in the naval tree. 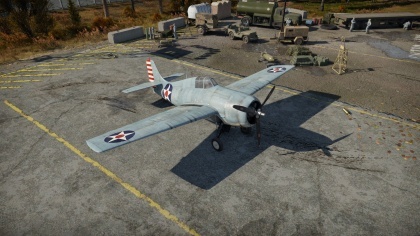 While being slightly slower, climbing slower and turning worse than the previous F2A-3 Buffalo you unlocked, the Wildcat has two extra Browning M2's which ups the firepower by a decent amount. The Wildcat is also better at altitude than the Buffalo, meaning it's a better dogfighter at a high altitude. Given its traits, it is recommended to use the Wildcat as a high altitude dogfighter, although its mediocre climb rate makes it difficult to out-climb the opponents you face. 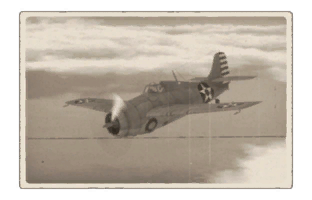 The clipped wings and light weight of the F4F-4 allows for a very solid roll rate while having little effect on its turning capabilities, as it will still be able to outturn most enemies. The Wildcats have two large and easy to hit fuel tanks that are placed in the centre of the fuselage, and a big oil cooling system in the cowling. This means that any pilot who knows where to aim will be able to seriously cripple you and send you limping back to the airfield if they don't kill you outright. When facing against a Wildcat pilot, a smart Wildcat pilot will assess the situation it is in and plan accordingly. If you are in a plane that turns worse, do not take its bait to make you turn fight them, so try to Boom-N-Zoom it and vice-versa for a plane that turns better but is slower. If you liked the F4F-3 Wildcat but was disappointed by its poor armament, you will welcome the upgrade in firepower from the F4F-4. The 2 extra M2 Brownings increase the firepower from the Buffalo and F4F-3 by an entire kilogram, reaching a respectable one second burst mass of 3.30 kg/s compared to the previously mentioned Buffalo and F4F-3's 2.20 kg/s. However a downside to this change is a much lower ammo count per machine gun load. The total ammunition load is the same at around 1,400 rounds, but compared to the F4F-3's 450 rounds per gun load, the F4F-4 only has 240 rounds per gun. As such, the time span of firing is reduced greatly for the gain in increased fire saturation. As with any American fighter, you should break into a climb at the start of a match, attempting to reach an altitude of 3,000-4,000 meters where the Pratt and Whitney R-1830-86 radial starts increasing performance. If you encounter an enemy you know you can outturn, turn fight them and make good use of the rudder. As you climb, you will encounter enemies that outclass you in many ways such as BF 109 E-3/4's and F-1's, C.202EC's and C.205's, Zeroes and the Dreaded J2M2. Do not engage with any of these targets! All of the previously mentioned planes will rip you to shreds and almost completely outclass you. When encountering enemies, there are some that should be highlighted as dangerous to the F4F-4's well-being. BF 109's: The legendary Messerschmitts out climb you, out run you and in some cases, outturn you. E-4's and F-1's are the most common versions you will come across, but you can face the F-4 which is entirely superior. You can outturn the E-4, but be weary of its twin MG FF/M carrying the volatile minengeschoß round. However, do not engage with the F-1, as it turns better and is faster than you while still mounting a single MG FF/M which only needs to land a few shots before downing you and the same goes for the F-4 which mounts the more powerful MG 151. A6M2's: Zeroes are an interesting opponent to fight, but are easily countered. Zeroes turn better than almost every plane in the game but are painfully slow, so abuse their low speed to Boom-N-Zoom them, but be careful about their two 20mm cannons which can still down you as you fly away. J2M2's: The Raiden is the ultimate counter to the Wildcat. It is better at altitude, climbs almost twice as well, is faster, and mounts two powerful 20mm Type 99 Mk2 cannons which can rip you to shreds, and as such, you should avoid them at all costs. However, if you are forced to fight one, use your better turn time to try to get on its tail, but it is the best course of action to fly towards teammates so they can help get rid of it. For firepower modules, outside of upgrades for the machine guns, the unlock of the module Mk.41 will allow the F4F-4 to mount two 100 lb AN-M30A1 bombs.